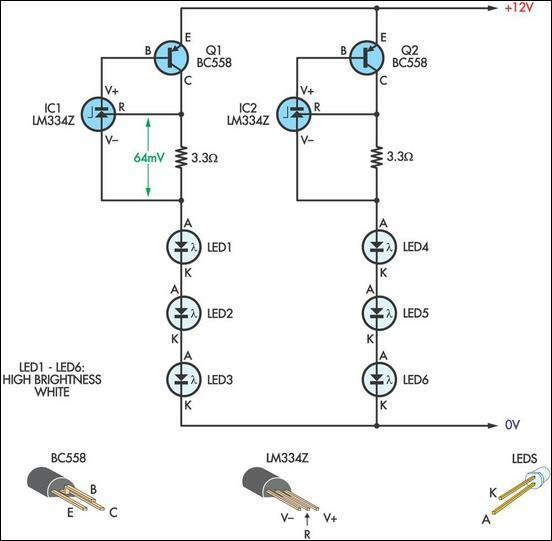 This LED lamp was originally designed for use on a budget solar-charged 12V electrical system. It is bright enough for comfortable reading at night and features constant LED brightness with diminishing battery voltage. The circuit uses six high-brightness white LEDs mounted in a 90mm diameter reflector. The upper half of a stainless steel ice cream bowl makes a good reflector but almost any torch reflector of a similar size will do. As shown, two banks of three series-connected LEDs are powered from a 12V (nominal) DC supply. The LEDs used are rated at 20mA maximum with a measured voltage drop of 3.2V. Each bank combines an inexpensive LM334 current source IC with a BC558 transistor to provide a constant 20mA to the LED string. Basically, the LM334 controls the base current of the BC558 such that 64mV appears between its "R" and "V-" terminals. With the 3.3O resistor shown, this results in close to the desired 20mA through the LEDs. The components can be mounted on a small piece of Veroboard. An old desk lamp makes an ideal body, with a metal disc used to cover the hole left after the 240V lamp fitting is removed. The metal disc can also be used to mount the power switch and rubber grommet for the power supply leads. Three M3 screws and nuts spaced 120° apart keep the reflector in place.